When designing on a budget, there is nothing better than incorporating great quality and stylish vintage (or second hand/thrift store/garage sale/road side throw away) pieces which can be used to draw inspiration for a project. However, sometimes in order to use a key piece you might have to give it a "second debut", and restore it to its former glory. ONCE I set my eyes on this mid Century Walnut dining room credenza, and I knew this was going to be my key piece. 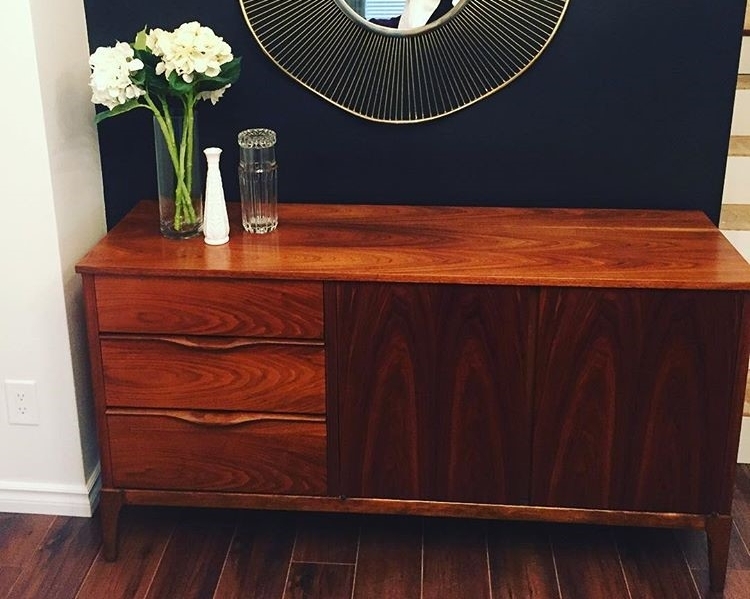 Found this Mid Century Walnut Credenza at a Vintage shop, and it needed a lot of work, as it was marked from water damage and had some overall scratches and hard wear. ... having an SUV for all my vintage finds and material hauls, is an absolute necessity. Stripping off layers of old yellowed Varnish..I used Citristrip which is a 'SAFER' chemical stripper. It's a gel like consistancy that is much better than harsh chemical strippers, but is still effective in getting the job done. Stripped and ready for sanding. For all my refinishes, I use a Dewalt adjustable speed orbital hand-sander. I Started this piece by using a 120 Grit sandpaper by carefully and evenly sanding to retain the integrity of this beautiful vintage veneer. After sanding out rough spots and water marks, I graduated to 180 grit and 320. Final finish is usually between 400-600 grit before and during treating the wood to a finish. My choices for sandpaper grit usually vary based on the character and condition of the individual piece as well as the species of wood. doors off to get a really good even sand around all the nooks and crannys. Keeping my lungs happy and healthy by using proper protection. This is a Honeywell respirtor with Filter P100. will you look at that grain.. In lieu of wood stain, because walnut is so naturally beautiful and rich, I choose Tung oil ( you can also use Danish Oil, Teak Oil) to give this beauty deeper colour and enhance the grain and glow. I applied about 6 coats of oil ( 6 hrs wait time btwn coats )and gave it about 2 weeks to "cure" so that the raw wood could fully "drink up" the Tung oil before I applied 4 coats of a water based Polyurethane to protect that beautiful finish. Polyurethane manufactures recommend sanding in between coats. I am not a fan of this unless there are wood fibers or dust particles that need to be knocked down in between coats. I find sanding in between coats can easily scratch and cloud up the poly or even more annoying burn through the poly down to the wood. Reading other wood working blogs, there is a theory that poly manufactures assume that people apply coats that are too thick to start with, and/or want to sell more product, so they recommend sanding in between final coats. If you must sand in between, I prefer a wet sand. Wet paper and lightly water spritzed wood with a fine, 400-600 grit paper. Slow, steady and even pressured sanding strokes is the way to go.